Nolan Arenado was born on Tuesday, April 16, 1991, in Newport Beach, California. 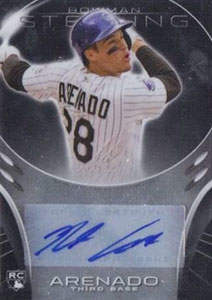 Arenado was 22 years old when he broke into the big leagues on April 28, 2013, with the Colorado Rockies. His biographical data, year-by-year hitting stats, fielding stats, pitching stats (where applicable), career totals, uniform numbers, salary data and miscellaneous items-of-interest are presented by Baseball Almanac on this comprehensive Nolan Arenado baseball stats page. Did you know that third baseman Nolan Arenado was only the fifth player in Major League history to win consecutive Gold Glove Awards in his first two full seasons (2013-2014) of play, joining Frank Malzone (1957-1959, Gold Glove Third Baseman ), Hall of Famer Johnny Bench (1968-1977, Gold Glove Catchers ), Charles Johnson (1995-1998, Gold Glove Catchers ), and Ichiro Suzuki (2001-2010, Gold Glove Outfielders )? Did you know that Nolan was the sixth player in Major League history to hit for the cycle and complete the circuit with a a walk-off home run? Cycle / walk-off homer hitters who came before Nolan ( June 18, 2017 ) were Ken Boyer ( September 14, 1961 ), Cesar Tovar ( September 19, 1972 ), George Brett ( May 28, 1979 ), Dwight Evans ( June 28, 1984 ), and Carlos Gonzalez ( July 31, 2010 ). In 2015 , Nolan Arenado hit forty-three doubles, four triples, and forty-two home runs - 89 extra-base hits, the most extra base hits in a season by a third baseman in Major League history, surpassing the mark set by future hall of famer Chipper Jones in 1999 , who had forty-one doubles, one triple, and forty-five home runs - 87 extra base hits. On September 13, 2018, Nolan Arenado drove in his 100th RBI of the season with his 34th home run. It was the fourth consecutive year (2015-2018) where he reached 100 RBI and 30 homers, a feat matched previously by only three other third baseman in baseball history; Vinny Castilla (1996-1999), Chipper Jones (1998-2001), and Alex Rodriguez (2006-2010).